We just had a Samurai Sword Handle Umbrella. Today you will see more "sword umbrellas". Fight the Rain! Umbrellas for the Civil but Discontent Man designed by Bruce and Stephanie Tharp of Materious. "Sigmund Freud contends that aggressiveness is a fundamental human instinct whose inhibition is a necessary obligation of social life. 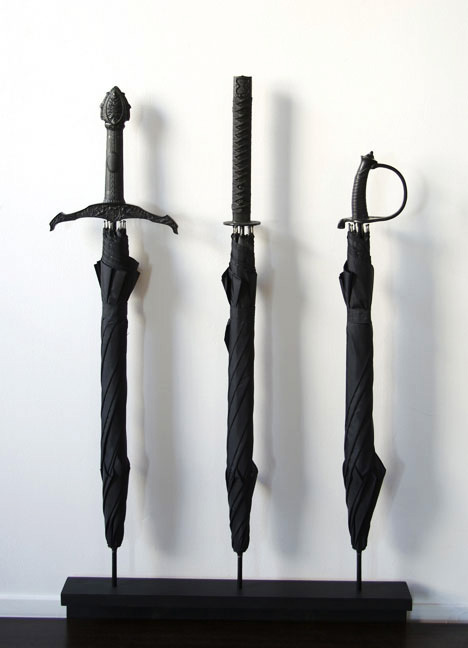 These umbrellas combine a symbol of gentlemanly refinement--the full-sized, black umbrella--with an element from more manly sword-bearing times. The umbrellas offer brief psychological respite from the dictates of social amiability."